The old song goes Que sera sera, but when it comes to matters of time, there are moments when it is less 'what will be will be' and more 'what will be has already been done'. This is something that the modern series has often tackled with the introduction of fixed moments in time but it was something that the classic era hardly went near. The mind-bending opening two-part story from Jonathan Morris is a grand concept on a small scale, though it is no less for the characters involved. As with anything built around this kind of time travel, it would be a bad idea to get involved in the plot as it would spoil things but Morris gives the Sixth Doctor and companion Flip, played by Colin Baker and Lisa Greenwood, plenty to do. Flip in particular, gets to deal with some pretty difficult circumstances here, made all the better by Greenwood's strong performance. The second story by Ian Potter is also about pre-destination, just twisted in a slightly different way as the scale of events begins to dawn on the Doctor. The Sixth Doctor's tendency to boast does him no favours on this new world however and it draws him away allowing the story to focus more on Flip. 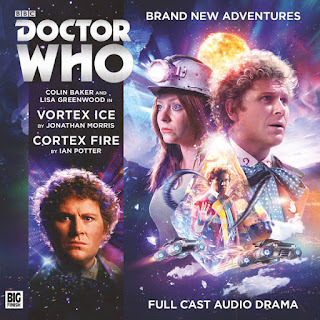 Vortex Ice/Cortex Fire is a strong release, made better by the great guest cast. Many of the guest cast are new to the world of Big Finish and make such a great impression that I hope this isn't the last we hear from them.